On 1 July 2010, Middlesex University's Centre for Research in Modern European Philosophy (CRMEP) announced its transfer across London to Kingston University. Four staff, including three professors, and three MA programmes made the switch, which will be open to new applicants for October 2010. The offer provides for all current postgraduate students, allowing them to continue their study at the new venue. This noteworthy outcome, surprising in view of the general financial gloom, seems to have drawn a line under the vibrant and internationally popular campaign that mobilised against the April decision of Middlesex's senior management to close recruitment to all Philosophy programmes. While not involving immediate threats of redundancy, with no new students arriving and all courses therefore closing by 2012, the CRMEP was faced with a slow demise. Accounts of this movement with its extensive online and press coverage (including the twelve-day student occupation of Middlesex's Mansion House building) can be found elsewhere.1 Here, I would like to consider the broader significance of these developments, which point beyond the general context of cuts and redundancies, to the different strategies available to universities in the current funding context and the place of philosophy as an academic discipline. I cannot pretend to be dispassionate about the place where I was based for over seven years. I first enrolled on the Modern European Philosophy MA programme, attracted by its 'marked sense of social and political engagement' and approach to the subject; its openness to those who had not previously studied philosophy; and its commitment to evening classes, which allowed me to study part-time. Readers in London and beyond will likely be familiar with the CRMEP. Firstly, it has consistently advanced the reception of contemporary French philosophy with events, translations and studies on, for example, Alain Badiou, Jacques Rancière and Félix Guattari. Most recently, the centre completed its Cahiers pour l'Analyse project, which was funded by the UK's Arts and Humanities Research Council (AHRC) and is now available as an open-access, online resource (http://fass.kingston.ac.uk/research/crmep/cahiers/). Secondly, its informed approach to art practice, exemplified by its Aesthetics and Art Theory MA, is superior to that of most philosophy departments, where lack of familiarity with contemporary developments often means outmoded reflections are mistaken for valid insights. Alongside the objective factors mentioned above, there seems to be a further cause contributing to the weakness of contemporary British Philosophy as an academic discipline: the lack of agreement over what it is. Distinguished in these ways, its rigour and standing were reflected in its achievements in the last two research assessments (2001 and 2008), which are conducted by the Higher Education Funding Council for England (HEFCE) to determine the allocation of 'quality-related' research funding ('QR money') to universities. Poor showing here has been the downfall of other departments around the country, but Philosophy was the highest-rated at Middlesex. Initially, whilst announcing the decision to end recruitment, the Dean of Arts and Education, Ed Esche, stated that the reasoning was 'purely financial' and that the department's reputation, excepting the income it generated, was not a 'measurable contribution'. As it turns out these 'purely financial' considerations require some untangling. Ostensibly the decision to shut BA Philosophy was attributed to low levels of recruitment in preceding years, but the figures cited by Esche and other spokespersons referred only to undergraduates enrolled as Single Honours,2 ignoring students following compulsory and elective Philosophy courses as part of other degrees and those on the three MA courses, which claim the highest number of postgraduate Philosophy students in the UK. Later briefings from Middlesex management suggested that Philosophy was being subsidised by other subjects, but on further investigation this interpretation rests on the striking manner in which Middlesex assesses profitability. Internal policy stipulates that any subject grouping not contributing 55% of its total income to central administration, once salaries and other departmental costs are subtracted, is deemed to be 'loss-making'. In this exercise, Philosophy was joined with Religious Studies to make one 'subject'. For 2009-10, the grouping contributed 53%: missing the target by two percentage points; projections for 2010/11 would have seen the contribution increase to 59%.The pettifogging that would close a centre over this temporary dip in self-imposed management targets seems to support the view that we were witnesses to a paroxysm of incompetence. But in the context of what other departments are achieving and to what ends the university's central monies are directed, it may be significant. In its FAQ on the 'financial situation of Philosophy', Save Middlesex Philosophy write, 'It is not possible to say how - if at all - the overall sum relates to the university's actual central expenditure on facilities for teaching and research. '3 The implication is that this contribution is spent on other activities. One way to get a handle on what seems to be a punitive, irrational culture is to realise that Middlesex is an institution with a distinct vision of its future priorities. It has campuses in North London but also two in Dubai and Mauritius, with a further one to open near Delhi. Students graduating successfully overseas receive a degree from a UK Higher Education Institution no different from those received at its home sites. The 'British operation' differs by the breadth of courses on offer; those abroad can only study a limited range which includes Accountancy and Finance, Business, Computer Studies and Tourism Management. Middlesex appears to have a 'comparative advantage' here: in the recent past it gained a Queen's Awards for Enterprise linked to the number of overseas students on its courses; its Financial Statement for 2008/09 notes that its 'main areas of income growth were in overseas fees and [degree] validation and partnership income', where the latter, at nearly £3.5 million, exceeds all research income besides its QR money.4 Capitalising on this advantage may have to be done at the expense of less profitable departments, as the investment needed to develop overseas is large. Additionally, Middlesex may be inclined to close departments that do not fit the management indicators and streamlined administrative structures that will have to be introduced to make a success of an overseas multi-campus operation.5 Small, academic departments like Philosophy, not so amenable to quantified, uniform modes of assessment, seem particularly vulnerable from this perspective. There is a further nuance. The HEFCE awards QR money to institutions annually. Philosophy earned Middlesex £173, 260 in 2009/10. Now that David Willetts, the new Minister of State for Universities and Science, has delayed the next assessment of research by one year, a similar amount of money will be paid to Middlesex each year until 2015.6 Since it operates a tendering exercise which funds future activity on the basis of past results, HEFCE allows institutions free rein to determine how the money awarded is used. HEFCE will therefore continue to award the money to Middlesex even though the CRMEP has gone and the Philosophy department will cease to exist by 2012. Kingston appears to be making no demands on that income and HEFCE has washed its hands of what could be an extremely awkward situation. It is unprecedented for a university to shut down its highest-rated research department. That Middlesex will continue to receive public money for the research done by this department is deeply troubling. Middlesex is effectively allowed to strip the research assets of Philosophy: the income that was enabling a subject grouping to 'break even' could instead be removed as pure surplus and directed elsewhere. Where the rationale of self-preservation comes into conflict with the public remit of universities, what mechanisms are there to manage the resulting tensions? Middlesex can be seen as launching itself into a new privatised terrain fuelled by the old way of doing things. Kingston's largesse demonstrates that there is an alternative strategic vision - one that will hopefully enable the CRMEP to retrench and flourish in more supportive surroundings but which is not without its own risks. The centre's reputation and impact will give weight to the London Graduate School, which has been recently inaugurated there. However, the investment extends only to the research centre and does not cover all Middlesex philosophers: two staff are left behind. Though three MA programmes were switched over along with the centre,9 there will be no Philosophy department at Kingston and no undergraduate degrees. This is a real blow affecting current students, who were at the heart of the occupation of Trent Park campus, including three who were suspended and made subject to disciplinary proceedings. It is clear that the BA Philosophy was always the weak link in any such dispute: it was not run under the CRMEP aegis and the professorial staff had little, if any, teaching on it. There was an agreed policy with the previous Dean of Arts and Education to concentrate on growing the postgraduate provision.11 It is hoped that Kingston will review the possibility of introducing a BA course at a later date. 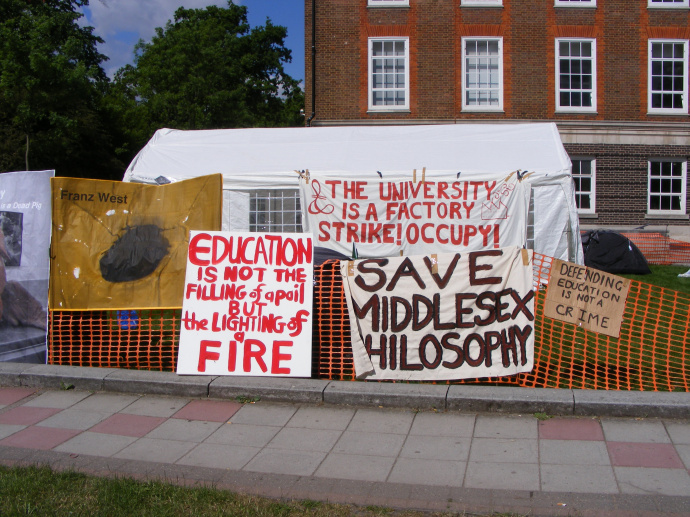 Save Middlesex Philosophy has now had the summer to review how to support the remaining students and to progress any further, formal recourse. Given the specifics detailed above, it is hard to reach general conclusions from this particular case. It seems unlikely that many other institutions will be able to mimic the Middlesex strategy. That said, when considered alongside the coming government cuts and the tendency to protect Science, Technology, Engineering and Mathematics (STEM subjects), the current climate presents the arts and humanities with difficulties. Few universities have the war-chest available to Kingston, fewer will at this stage commit to backing arts and humanities research in the way it is doing (this summer, it has made several other professorial appointments in the arts). Recently averted threats to jobs at King's College London and the Philosophy department at the University of Liverpool, along with the closure of Single Honours Philosophy at Roehampton University, suggest a subject struggling nationally. This vulnerability is mostly felt outside of the bigger, research-intensive universities, where its disappearance appears to be a possibility. Alongside the objective factors mentioned above, there seems to be a further cause contributing to the weakness of contemporary British Philosophy as an academic discipline: the lack of agreement over what it is. Philosophy has 2,000 years of history but is framed by its original demand to be 'wisdom' (sophia) and hence relevant to life. Briefly put, its questions are: what can one know? How is one to live? Regarding the first, we have the frequently told story of the historical transformation from 'natural philosophy' to philosophy: one where other disciplines, with particular content, break off and separate, leaving philosophy today only with its technical, epistemological core (concern for the validity of forms of argumentation, the limits of reason and experience, or the grounding of scientific methods, broadly conceived). From the other question, what might be seen as the existential pole, we have a history of ethical and political worldviews, perhaps still struggling with its relation to theological and religious modes. Despite the frequently invoked division of 'analytic' and 'Continental' philosophy, more telling are the tendencies, tensions and complexities resulting from this fundamental formation and its subsequent, more recent institutionalisation within universities. There is little agreement over either the current province of the subject (whether in terms of identifying properly philosophical problems, technical achievements or key figures) or the manner in which it is able to determine itself without recourse to the findings of other disciplines. In this latter regard, Oxford University only offers philosophy combined with other subjects in Joint Honours degrees; equally, Middlesex's earlier decision to abolish such options undermined undergraduate Philosophy numbers. We should not expect agreement on these kinds of issues, but, regardless of whether this disagreement is healthy or confused, the current situation throws into relief the manner in which Philosophy presents itself in relation to other subjects and, more importantly, publicly.12 In the face of contemporary pressures, many departmental websites advocate a vocational take on the subject stressing the 'transferable skills' gained through practical training in reasoning, logic and analysis. The comparative failure to rethink the pedagogy of philosophy means that the common, alternative attempt to expose students to varied worldviews, or ways of life, engenders a consumerism - doing philosophy becomes choosing a standpoint. This is particularly evident in the general privileging of existentialism - even a compulsory course in some universities - over its technical basis in phenomenology. Though there are some notable exceptions, the 'skills' or 'information' models for undergraduate teaching dominate and share some assumptions about the public's lack of philosophical understanding. One example: with roughly twenty years of the A-level options in Philosophy, Philosophy of Religion and Critical Thinking, how do courses make allowance for prior study? The message expressed and promoted by many departments belittles or ignores what might have been learned before arriving at university. The manner in which UK philosophers write books for a general audience is revealing here: they look like primers for (smart) children. Slavoj Žižek's popularity is not unconnected to his eschewal of this form. The time is right for some concerted self-criticism. Aren't undergraduate philosophy degrees due a progressive overhaul? People come to what they identify as philosophy for a variety of reasons - how to tap into this motivation is possibly, at root, a question of the intellectual formation and reproduction of academics. Faced with present need to justify its existence to maintain recruitment levels and funding, it is perhaps naïve to wager that it is still possible to advance philosophy as a vital, lively subject adequate to contemporary life and offering a distinct, critical purchase upon it. But that option is probably more appropriate to current conditions than is the learned response of many advocates: that is, to extol the virtue of leisured or cloistered intellectual contemplation in the midst of modern life preoccupied with utility, or to settle for the position as underlabourer to the sciences. Given the historical formation of disciplines, it is important not to conflate philosophy in the broader historical scheme of things with the existence of Philosophy departments, which neither guarantee nor monopolise the production of 'philosophical' work.13 The British Philosophical Association is currently attempting to identify academics in 'new universities' who have trained in Philosophy, but now operate in sections bearing different titles. Tellingly, philosophy courses will continue to be taught at Middlesex, for example, on the BA Fine Art and Critical Theory. Since HEFCE has recently classed modern languages as 'Strategically Important and Vulnerable' and introduced accompanying initiatives14 - those aiming for careers in Continental philosophy may be best advised to brush up on their languages and move into French, German and Italian departments. The CRMEP is indeed an enclave of intellectual life in contemporary UK Philosophy. Its transfer to Kingston represents a unique outcome: an analogous fallback option will not be available to the next threatened department. Clearly, not all institutions will take the strategic decisions made by Middlesex, but, given the limited sources of external income available to Philosophy, even those keen to continue offering what they currently do will be faced with financial pressures which may preclude this. As David Cameron announces that the cuts will not be reversed once the short-term exigency of lowering the debt is met, philosophy may be faced with the prospect of looking outside the university for a productive future. Andrew McGettigan analyses the problems in practice-led art PhDs, suggesting some alternative approaches.